http://www.jewishworldreview.com | It does not bode well for President Bush's newly announced Middle East peace effort that within hours of his stated optimism about the future of the "peace process," the first candidate to announce for the office vacated by Yasser Arafat's death was Marwan Barghouti, who is serving multiple life sentences in an Israeli prison for an attack that killed four Israelis and a Greek monk. "We've got a great chance to establish a Palestinian state," the president told a joint news conference with British Prime Minister Tony Blair last Friday. In a statement following Arafat's death, the president said that the United States would deal with a "democratic" leadership that emerges from free elections. Can elections, which will be held before Jan. 9, produce a true democrat, or one more Palestinian president committed to killing instead of peace? The other possible candidates also reflect Arafat's strategy of using terror to eradicate the State of Israel and all Jews. There are no leaders who openly favor making peace with Israel because Arafat had them executed. Three who have assumed senior leadership positions of the major Palestinian Arab institutions are Mahmoud Abbas (also known as Abu Mazen), Farouk Kaddoumi and Ahmed Qureia. A quick look at their resumes does not give confidence that these guys are the peace-loving democrat leaders sought by President Bush. 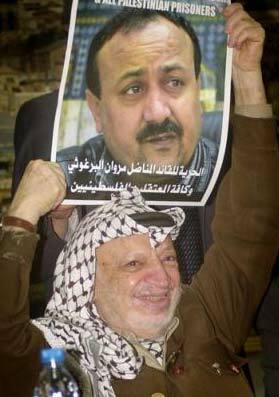 Mahmoud Abbas, the new chairman of the Palestine Liberation Organization, served for 40 years as Arafat's deputy. He orchestrated numerous terror attacks against Jews. On July 23, 2003, Abbas said in Cairo, "Cracking down on Hamas, (Islamic) Jihad and the Palestinian organizations is not an option at all." Both The New York Times and Israeli Radio reported on March 31, 2003, that Abbas, a former Palestinian Authority prime minister, had offered Cabinet positions to leaders of Hamas and Islamic Jihad and praised Arab terrorists imprisoned by Israel as "political prisoners" and "heroes." Abbas is the author of a book that denies the Nazis murdered 6 million Jews. Farouk Kaddoumi is the longtime "foreign minister" of the PLO. He has been named chairman of Fatah, which controls the Tanzim and Al Aqsa Martyrs' Brigade. These groups are on the official U.S. list of terrorist organizations. Kaddoumi told the Hezbollah television station, Al-Manar (as quoted in Ha'aretz Nov. 11) that violence against Israel is still a legitimate option. Two years ago, Kaddoumi declared "the PLO no longer recognizes Israel and adheres to its national charter." Thirty of the 33 clauses in the PLO charter call for Israel's destruction or violence against Israel. Numerous statements by Kaddoumi over the years have made it clear that he, like Arafat, has no intention of settling for anything less than all of the land and none of the Jews. Ahmed Qureia will continue in his present post as prime minister of the Palestinian Authority. Qureia has been responsible for many of the PLO's terrorist operations, which in just the past four years have murdered 1,288 Israelis. Qureia has opposed action against terrorists, attacked President Bush for referring to Israel as a "Jewish state," declared his hope that Britain would "correct the historic mistake (it) committed against Palestinians through the Balfour Declaration in 1917" (which declared Britain's support "in Palestine for a national home for the Jewish people") and publicly trampled on Israel's flag. The vision for Israel's future must be based on something other than fantasy. Hoping that these killers will suddenly beat their swords into ploughshares, or that the brainwashed "Palestinian people" will elect a true democrat or someone who would pursue objectives other than those of Arafat and his henchmen, is wishing upon a star. Since Israel's establishment as a modern nation in 1948, pleadings for peace have traveled in just one direction. Peace can't be made in a vacuum. It takes two peoples committed to democratic longings and religious liberty. So far, only one side has demonstrated a commitment to such principles. It would appear that no one running to replace Arafat, and probably most, if not all, of those voting for his successor, will express anything but the dominant religious and political party line. To do otherwise would render their vote - and probably their life - null and void.